We are looking for friendly, talented, and energetic individuals to join our family. If you are an ambitious, energetic person who enjoys a fast-paced team environment filled with challenges and opportunities, you’ve come to the right place. Our employees are service-oriented people with integrity and commitment toward a common goal of excellence. We have great opportunities for those who thrive in a fast-paced environment. We are interested in hearing about your talents and experience. Submit an application online or apply in person. The Front Desk Clerk plays a critical role in the overall operation of Aiea Bowl. The Front Desk Clerk works directly with customers and the Operations Manager to create an inviting & safe environment at Aiea Bowl. The Front Desk Clerk is also responsible for answering phones, customer service, customer questions/requests and overall customer satisfaction. Remember the Front Desk Clerk is the first and last person the customer sees. Has a customer comes first attitude on the job. Delivers exceptional customer service to all customers by taking a genuine interest in the customer’s satisfaction at Aiea Bowl. Is able to take calls and messages professionally and concisely according to the rules set forth in the “Phone Etiquette” section of the handbook. Working knowledge of Bowling Alley’s computer system, PA/Intercom system, and phone system. Assists customers with shoe rental, ball rental, and lane issues. Clean, sanitize, and up keep rental bowling shoes. Organizes reservation and assists the Operations Manager in monthly bowling leagues and tournaments. 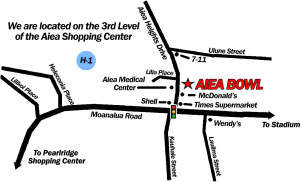 Basic knowledge and understanding of all operations in Aiea Bowl. Ability to take direction from the Operations Manager. Ensures a safe work environment for everyone by promptly cleaning up all spills. Is able to adhere to the Dress Code that is set forth by G & G Entertainment Inc. and arrives to their shift on time, in complete uniform, and is ready to work. The Front Desk Clerk job duties/responsibilities are not limited to the list above. Able to resolve customer conflicts in a precise and professional manner. Able to retain and build new customers on the basis of great customer service. Is able to communicate effectively to customers and all levels of employees. Basic Cash Handling experience required; good arithmetic skill required. Able to multitask and to stay calm under stressful/unusual circumstances. Able to work with Team members in a diverse work environment. Exhibits leadership skill and takes initiative in job advancement. Takes responsibility for their actions and shows a genuine interest in the profitability of Aiea Bowl. Maintains consistent attendance and punctuality. he Counter Staff position plays an important role in overall operation of The Alley Drive-In. The Counter Staff interacts directly with customers and fellow employees to create shining moments at The Alley Drive-In. The Counter Staff is also responsible for guest satisfaction through excellent customer service, cash handling, and answering phones. Responsible and accountable of contents and accuracy of own cash drawer. Is able to take calls and reservations professionally and concisely according to the rules set forth in the “Phone Etiquette” section of the handbook. Keep the Front Counter and Windows sanitary, clean and presentable at all times. Must be pleasant, courteous, professional, and respectful of guests at all times. Take customers order in a timely and precise manner, and deliver correct order to customers. Able to work most or all of shift standing up. Ability to be flexible in regards to scheduling and work duties. Able to learn and use effectively the computer POS system/cash register. Demonstrates personal ownership and quickly corrects customer conflicts and disputes. Ability to learn how to expedite orders and work well with the kitchen staff. Is able to comply and is familiar with the Health Standards set forth by the Public Health Department of the State of Hawaii. Contributes positively to the company’s profitability by monitoring waste, inventory overages/shortages. Is able to adhere to the Dress Code that is set forth by G & G Entertainment, LLC and arrives to their shift on time and in complete uniform. Able to multitask, prioritize, and stay calm under stressful/unusual circumstances. Is able to communicate effectively to all levels of employees and is able to take direct orders from the Executive Chef. Able to work well with fellow Team members in a diverse environment as a team member. Excellent Hand and Eye co-ordination. A keen sense of taste and smell. Takes responsibility for their actions and shows a genuine interest in the profitability of The Alley. The Party Host/Hostess position plays an important role in overall operation of reservations. The Party Host/Hostess interacts directly with customers and fellow employees to create shining moments for reservations made at Aiea Bowl. The Party Host/Hostess is also responsible for guest satisfaction through excellent customer service, cash handling, and distribution of rental shoes, light balls, ball slide ramps, or any other items ordered by the customer. Is able to take calls concisely according to the rules set forth in the “Phone Etiquette” section of the handbook. Keep the Front Desk sanitary, clean and presentable at all times. Must be able to set up designated area for reservation. Area should include table(s) for food, decorations (if applicable), and reservation sign(s) on adjacent tables. Is able to communicate effectively to all levels of employees and is able to take direct orders from the Events and Catering Coordinator, Executive Chef, and other cooks on duty. The Bowling Manager is responsible for the overall Bowling Center Staff, daily operations of the bowling leagues. The Bowling Manager is able to plan and work closely with the Operations Manager and the Reservations Manager with parties, special events, weekly promotions, and scheduling of staff. The Bowling Manager is also responsible for training, evaluating, and motivating the bowling alley staff to exceed. Must have a flexible work schedule and be willing to work late nights, weekends, and holidays. Plans and coordinates work activities necessary to operate the bowling center. Assigns responsibility areas and work schedules. Hires and trains employees in guest service, job skills, safety practices, organization policy and performance requirements. Organizes bowling leagues, retains existing leagues, and informs members of league requirements. Is able to hire and train all supervisors, janitors, party hosts and front desk staff through hands on training, and coaching throughout the training process. Evaluates the performance of the staff and corrects poor performance as immediate and necessary through direct coaching methods, feedback, and positive reinforcement. Is able to suspend and terminate any staff on the basis of performance against their job description, poor/inattentive attitude, misconduct, or repetitive violations. Is able to fluidly communicate, by written or oral means, to the Owner, Operations Manager, Reservations Manager, Janitors, Party Hosts, Mechanics and Front Desk staff. Is able to delegate and determine priorities on a daily basis. Inspects facility for compliance with occupational, health and safety regulations. Ensures that employees are following safe working practices and have a working knowledge of all safety practices and procedures. Creates and enforces safe working procedures and practices for all Team members by instructing Team members on safety procedures and coaching them on safety issues. Follows the FIFO (First In, First Out) Method when storing foods (perishable and non-perishable). Takes a keen interest in P&L statements and thinks of ways to maximize profitability and performance. Ability to receive and verify all incoming invoices are correct. Able to visually reject products and produce that fall below Aiea Bowl standards of quality products. Contributes positively to the company’s profitability by monitoring waste, inventory overages/shortages, and product yield. Is effective at delegating and managing priorities. Exhibits Interpersonal Savvy and has an open line of communication to all staff. Creates a comfortable work environment for all Team members and encourages friendly competition to create synergy and maximize performance. Is able to adapt training styles and methods for different Team members. Takes personal pride in their work and is humble. Able to recruit new talent to the establishment. A good memory for details. Is a model of consistent attendance, punctuality, and dress code for all Team members. The Lane Technician/Mechanic will be responsible for the successful implementation of all mechanical and maintenance activities as set forth by the lead mechanic. This includes, but is not limited to; lane wood repair, electrical and wiring troubleshooting, mechanical disassembly and reassembly of pinsetter components. Maintain and repair pin spotters, lanes, scoring equipment, and lane cleaning and conditioner machine. Diagnose and repair trouble calls throughout shift. Perform preventative maintenance as needed or directed. Performs rebuilding and overhauling of equipment when necessary or directed. Is able to comply and is familiar with OSHA regulations and safety policies. Able to communicate effectively to all levels of employees with due respect and also receive constructive criticism and requests from all levels of employees with tact and poise. Able to get along with different types of people. Basic working knowledge of common hand tools. Able to recognize existing system of organizing and follow through with any and all products and inventory. Creative eye for improvement within the company to help increase efficiency and time management. Takes responsibility for their actions and shows genuine interest in the profitability of Aiea Bowl. Technical and/or Mechanical background preferred. Work experience may be substituted for education on a case by case basis. Direct communication with other staff and management. Calls the building security & police to report criminal acts, as required. Patrols parking lot when needed. Enforce rules often with early warnings. Maintain a list of banned persons who like to fight. Use force only in self defense. Help pick up finished bottles, cups, & dishes. Is able to communicate effectively to all levels of employees, customers, & management and is able to take direct orders from fellow workers. Pleasant Disposition, able to interact with customers. Clean and maintain: restrooms, outside facing of the building, windows, benches, walkways, and inside the bowling alley. Receives and stores all deliveries that are but not limited to: equipment, restaurant supplies, office supplies and cleaning supplies. Janitors are to assist the front desk, kitchen helpers, restaurant staff, bar and mechanics when needed. Ability to receive delivery and verify that all incoming invoices are correct. Assist bowlers by pushing loose pins back to the machine so it may be picked up by the pinsetter. Clean bowling alley which includes but is not limited to: emptying trash receptacles, regularly sweeping and mopping of floors, vacuuming carpet, washing windows, wiping down chairs and tables, cleaning/dusting of vending and gaming machines, restocking bathroom disposables, etc. Assist the restaurant in emptying trash receptacles, stocking the paper towel and soap dispensers. Cleans refrigeration filters, using vacuum and brush to remove excess dust and debris. Maintains bowling alley, restrooms and Janitor’s closet inventory. Assist the bar in grabbing alcohol and supplies. Is able to comply and familiarize with the Health Standards set forth by the Public Health Department of the State of Hawaii. Contributes positively to the company’s profitability by monitoring waste, inventory overages/shortages, and use of cleaning supplies. Is able to adhere to the Dress Code that is set forth by G & G Entertainment, Inc. and arrives to their shift on time and in complete uniform. Is able to communicate effectively to all levels of employees and is able to take direct orders from fellow workers. Excellent Hand and Eye coordination. Able to organize product and inventory. The Wait Staff/Food Server position plays an important role in overall operation of The Alley Restaurant. The Wait Staff/Food Server interacts directly with customers and fellow employees to create shining moments at The Alley Restaurant and Aiea Bowl. The Wait Staff/Food Server’s are also responsible for guest satisfaction through excellent customer service, cash handling, and answering phones. Keep the Waiter Station sanitary, clean and presentable at all times. Able to learn and use effectively the computer POS system. Ability to learn how to expedite orders and work well with the kitchen staff, along with the bartender for Restaurant drinks. The Cocktail Server position plays an important role in overall operation of The Alley Restaurant. The Cocktail Server interacts directly with customers and fellow employees to create shining moments at The Alley Bar and Aiea Bowl. The Cocktail Server is also responsible for guest satisfaction through excellent customer service, responsible cash handling, and prompt delivery of drinks and food. Able to greet and take orders from customers in the Bowling Alley area. Is able to communicate effectively to all levels of employees and is able to take direct orders from the Bar Manager and Executive Chef. In order to serve alcohol, a beverage server Liquor Commission card is required. A clean Alley Restaurant polo shirt. CoNon-Skidon-Slip, Non Skid shoes with socks. Hair must be neat and clean. Long hair must be tied back. No excessive make-up, jewelry, perfumes or colognes. All Bussers are to report to work on time and in full uniform; prepared to work when they clock in. The number of Bussers working at any given time will depend on the volume of business. All employee are expected to work in a harmonious fashion. Any disputes are not to be carried on in view of the public. Any disagreement between Bussers and other employees should be referred to the manager on duty. Guest interaction is an important part of the Busser’s job. Bussers must be professional and answer guest inquiries as needed. Be prepared to answer questions about the restaurant. Be prepared to assist guests with condiments, extra napkins, additional silverware, etc. Refill water glasses, soft drinks, coffee, & or tea. When serving coffee or tea, always askif they need cream, sugar or artificial sweetener. It may be necessary to help remove plates while the guests are still seated at the table. Remove plates only after asking the guest if they are finished. Remove the plates from the right of the guest whenever possible. After the guests have left, move condiments and table decorations to one corner of the table. Remove all plates, glasses, etc., and wipe crumbs onto tray or into a bus tub. Check chairs and booths for crumbs, and wipe clean. Check under table and surrounding floor area and sweep up any crumbs or litter. Busser should always sign his/her initials to the checklist when task is completed. Always be aware of litter on the floor and pick up any as you go through your station or anywhere else in the restaurant. Keep the restaurant free of debris and clutter. Wipe down and sanitize all high chairs and booster seats. Check with manager for any additional duties. The Bartender interacts directly with customers and fellow employees to create shining moments at The Alley Bar. The Bartender is also responsible for guest satisfaction through making and serving exceptional drinks, excellent customer service, cash handling, and answering phones. Keep the bar area (which includes areas such as under the counter, ice bins, sinks, refrigerators) sanitary, clean and presentable at all times. Ability to learn how to expedite orders and work well with the kitchen staff, cocktail servers and wait staff. Able to make all drinks to the standard pour set forth by the liquor commission. Has a working knowledge of mixed drinks, blended drinks, beers, liquors, etc. Have basic knife skills for preparation of garnishes for drinks. Is proactive in suggesting new drinks and ideas to the Bar Manager to increase sales and interest in The Alley Bar and Restaurant. The Restaurant Shift Manager is responsible for the overall Front of the House Staff, and the daily operations of the restaurant. The Restaurant Shift Manager is able to plan and work closely with the Bowling Center Management, Restaurant Management, Sous Chefs, and the Executive Chef in events relating to business with the Restaurant/Catering and the Bar Manager in events relating to liquor and alcohol. Plans and coordinates work activities necessary to operate the restaurant. Ensures all alcohol and beverage servers are trained and that the restaurant is in compliance with local alcohol regulations. Is able to hire and train all front of the house restaurant staff through hands-on training, and coaching throughout the training process. Evaluates the performance of the front of the house restaurant staff and corrects poor performance as immediate and necessary through direct coaching methods, feedback, and positive reinforcement. Is able to suspend and terminate any of the front of the house restaurant staff on the basis of performance against their job description, poor/inattentive attitude, misconduct, or repetitive violations. Is able to fluidly communicate, by written or oral means, to the Owner, Executive Chef, Restaurant Manager, Bowling Manager, and the front of the house restaurant staff. Takes personal pride and ownership in the restaurant and overall establishment. Reviews operational expense and other reports and keeps controllable costs in line. Takes a keen interest in P&L and thinks of ways to maximize profitability and performance. Able to visually reject products and produce that fall below The Alley’s standards of quality products and produce. The Line Cook will assist the Executive Chef in the daily production of all cooking at The Alley Restaurant. The Line Cook shall possess a basic understanding and skills needed for Culinary Arts. The Line Cook is in direct contact with customers and wait staff; cheerful disposition and interaction are required. Able to take direction and feedback from the Executive Chef and Pastry Chef. Able to make recipes according to standard set by the Executive Chef and Pastry Chef. Basic understanding of different cooking methods and sauces. Must be able to use a knife effectively to complete the tasks assigned. Is able to carry out plate presentations for The Alley Restaurant. Is able to follow and complete a Daily Task list of production. Is responsible for the stations daily mise-en-place. Assists with any and all venues, which includes but is not limited to on and off-site catering, buffet platters, and action stations. Monitors refrigerator and freezer temperatures and reports any significant change to the Manager on Duty. Maintains a clean and sanitary work environment, assists kitchen help with clean up. Responsible for changing the fry oil when necessary as well as upkeep of deep fryer. Is responsible for cooking to order all deep fried items to customer and/or Executive Chef’s specifications. Responsible for daily cleaning of the griddle and upkeep of the appliance. Is responsible for cooking to order food items to customer and/or Executive Chef’s specifications. Responsible for daily cleaning of the grill and upkeep of the appliance. Responsible for daily cleaning of pizza making equipment. Must have basic culinary knowledge, skills, and techniques. Is able to communicate effectively to all levels of Team members and is able to take direct orders from fellow workers. A Skills Assessment can be given to all candidates for this position for consideration at the discretion of the Executive Chef. Receive and store all deliveries that are but not limited to: Produce/meats/canned goods/cleaning supplies. Able to assist the counter clerk, line/prep/pastry cooks with their daily duties. Washes and maintains the dish and pot inventory. Regularly checks the delivery temperature of potentially hazardous foods such as meats and frozen goods. Maintains dish sink and pot room inventory. Assists the counter clerk with customer orders and expediting. Assists the Pantry Cook, Line Cook, and Pastry Cook with simple mise-en-place duties.